On November 23-24, 2012 in Kyiv was held the 1st Youth Kyiv Security Forum, where the modern issues of «human security» were discussed. 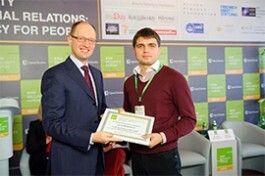 The Forum gathered young experts from 10 countries of the world. Experienced specialists from Japan, Germany, US, Switzerland, the Netherlands as well as representatives of international organizations in Ukraine have given their speeches to the youth.